-You forfeit the benefits of your Pokémon Tools that are currently in play. -The opponent can potentially get rid of it of the next turn by using their Stadium cards or Field Blower, which leads to your opponent getting back the benefits of their Pokemon Tool cards in play. Therefore, it’ll hurt you more than it helps. Although not related, Pyroar (SM Forbidden Light 19/131) has an attack that does more damage if there’s a Lysandre Labs in play. In this case, it costs RCC for 80 damage plus 60 more. Lacking Choice Band, 140 damage will, at best, OHKO most one-prize Basic Pokemon and some lower end EX Pokemon. The rest is 2HKOed. So even Pyroar can’t make the most out of this Stadium card when other cards are offline. Lysandre Labs (FLI 111) continues the connection between one of Pokemon’s greatest villains and the trading card game. This card disables every Tool card in play on both sides of the board. While this card seems very straightforward, it has led me to a more complex question: what is the value of Tool cards in the game today? Prior to FLI, players carried about 4.6 Tool cards in their decks. Post FLI, that number increased to 5.1 cards per deck, about a 12% increase. That stands as inarguable evidence that Tool cards have increased in value, but only two Tool cards make up more than 96% of all Tools played: Float Stone and Choice Band. Furthermore, none of the Buzzwole decks that dominated the top finishers at Madison ran any Field Blowers – they ran none at all. Now that might present us with a clue as to how to beat them (I’m thinking Wishful Baton… it doesn’t seem to be bugged on PTCGO anymore), but it also brings up the basic question: do Tool cards really make a difference in today’s game? I wouldn’t even begin to question the value of Float Stone – 93% of decks post FLI carried Float Stones in their deck, and those that did include it averaged 2.79 Float Stones per list. Choice Band was close behind, 87% of decks ran Choice Bands at an average 2.7 per deck. But considering almost every other Tool barely sees even remote usage, Field Blower counts continue to drop, and a card like Lysandre Labs which would presumably provide a tremendous advantage to a deck that used no Tools doesn’t even make a single deck in any of the lists available to us, we have to start wondering about how impactful Tools are to the meta today. 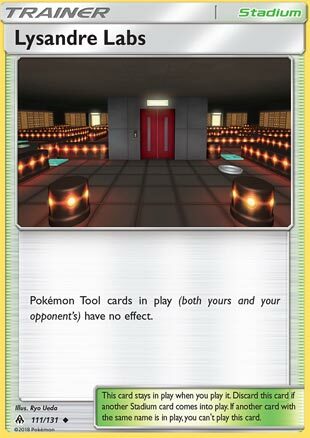 And after we lose Float Stone to rotation at the end of August, it would appear that Tool cards will have almost no relevance in the Pokemon TCG. So hopefully we’ll start to get some more Tools that will have more significance than the ones we have today. It’d be nice to see Tools like Lucky Helmet, Head Ringer, or Life Dew (obviously as a Prism card) return. I know this is a recurring theme with me, but we live in a very Item and Supporter poor meta right now. It would be great to have better ancillary cards to add more flavor, choices, and complexity to the game. 94% of all Supporters consist of a total of 5 cards. 9 cards make up more than 90% of all Items. Can we get some variety please? I did try Lysandre Labs with MarquisEXB’s Silvally Pyroar list, but I had no success with it, going winless in five games. I would say that it could potentially have some place in the meta, if only to turn off Float Stones attached to Dawn Wings Necrozma GX, but Parallel City and Brooklet Hill are out there, although I will say that in those five games, it seemed like my Lysandre Labs hardly ever got knocked out of play. With so few Field Blowers and decks typically running less than two Stadiums per list, it’s not surprising that a Stadium you put in play will stick there for several turns… if not the entire game.